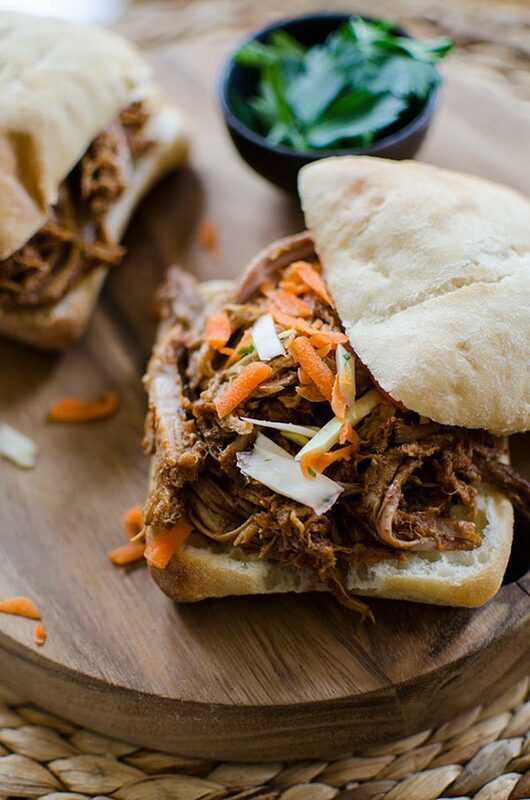 The perfect game day food, this recipe for slow cooker pulled pork cooks for 10 hours until it’s fall off the bone tender, packed with flavour from smoked paprika, pineapple juice and jalapeños. I couldn’t believe it when I realized I had never shared a recipe for pulled pork on here. I feel like it’s kind of one of those staple recipes that every blog should have. Pulled pork is an interesting one because I feel like there are so many different recipes out there and everyone has their favourite go-to recipe. Well, here’s my recipe; it’s sweet, but not sickeningly-sweet like the recipes that call for store-bought barbecue sauce. It’s got some heat that you taste in the back of your throat after a bite, but it’s not overwhelmingly spicy. It’s saucy, but not the kind of sauciness that will drip down your chin and ruin your white new white shirt (we’ve all been there). And it’s got a hint of smokiness that takes this recipe over the edge. I think it’s the combination of those four factors that make this the ultimate recipe for slow cooker pulled pork. The flavours come from a combination of simple and healthy ingredients (I know, pulled pork doesn’t really scream healthy, but take a look at the ingredients list and you’ll see what I mean). The sauce is a combination of pineapple juice (for a touch of natural sweetener), crushed tomatoes, low-sodium chicken broth and worcestershire sauce – no store-bought barbecue sauce to be found! The flavours for this pulled pork come from a combination of fresh ingredients and dried spices. The fresh ingredients are carrots, onion, garlic and jalapeños and the dried spices are a mix of chili powder, cumin and smoked paprika. It’s a lot simpler than you think and the slow cooker is the ultimate tool for making pulled pork. I opted to use a large piece of bone-in pork shoulder for this recipe, a whopping 2.5kg or 5.5 lbs, so this recipe makes a ton. If you’re feeding a crowd for a football game, it’s the perfect recipe to make the day before and it can be kept warm in the slow cooker so guests can help themselves. If you’re not feeding a crowd, I always like to freeze a large portion to enjoy later. Pork shoulder is a relatively inexpensive cut of meat, my local grocery store had it for $6/kg making this pulled pork a pretty budget-friendly dinner. I recommend always checking prices for meat and buying when it’s on sale to cut down on costs. Step 1: Brown the meat on all sides, cook out the vegetables and toast the spices. Step 2: Slow cook for 10 hours until the pork is fall of the bone tender. Step 3: Shred the meat, discard the bone and boil down the sauce until it’s thick and syrupy. Pat meat dry and season all over with salt. Heat a large frying pan over medium heat, add oil. Brown pork on all sides, about 3 minutes per side. Transfer to slow cooker insert. Add carrots, onion, jalapeños and garlic to the pan. Cook stirring often until softened, about 3-5 minutes. Stir in spices and cook another minute. Scrape mixture into slow cooker. Add chicken broth, crushed tomatoes, pineapple juice and worcestershire sauce. Cook on low for 10 hours. Remove pork to a large bowl. Strain sauce into a large frying pan, reserve vegetables and add to pork. Skim off any fat from sauce. Boil liquid, stirring often, until reduced to a syrupy consistency, about 30-35 minutes. Stir in vinegar. Using 2 forks, discard bone and shred meat. Combine with sauce. Serve over rice or on buns. This pulled pork freezes well. As this serves 12, I usually freeze half and thaw in the fridge overnight before reheating later on the stovetop. 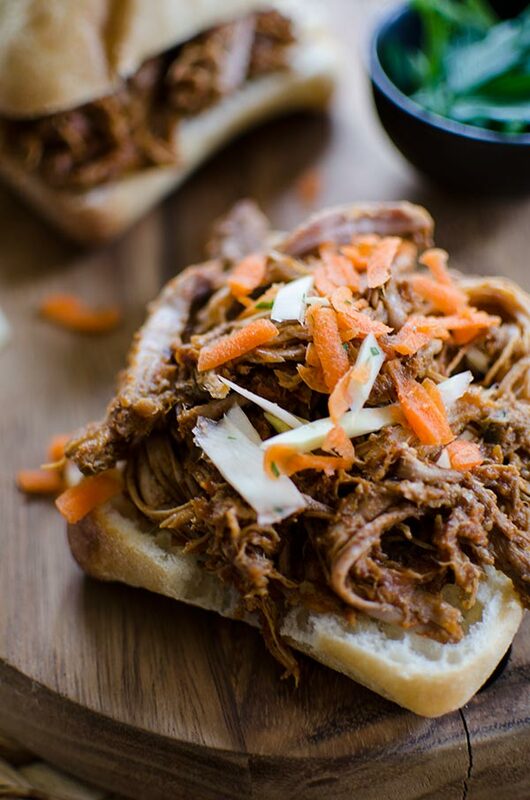 Let me know if you give this slow cooker pulled pork recipe a try, you won’t be disappointed! I NEED to make this this week! I have been craving a good pulled pork since returning from Maui and this spice profile looks like exactly what I want! Plus, who doesn't want to use their slow cooker?!?! Love all the flavours you've got going on in this pork... I could see this being a big hit the next time I need to make dinner for a crowd. 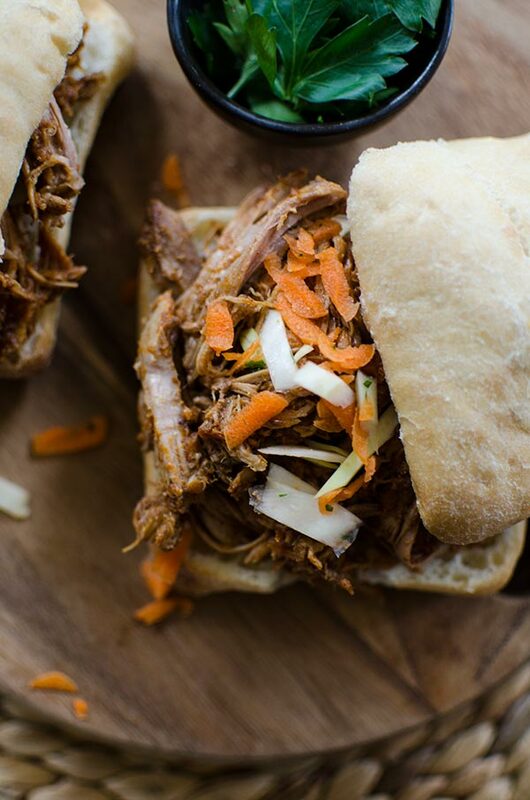 You just can't go wrong with a juicy pulled pork sandwich, especially when it practically makes itself while you take care of everything else! Thanks Isabelle! I feel exactly the same way about pulled pork...yum! yum! i love a good slow cooker recipe for during the work week! this looks great, i can see us making sliders and then tacos the next day. Yes this would be so good in tacos! It's also perfect to make during the work week because it requires a 10 hour cook time.